Ridgeway Furniture Company began as The Gravely Furniture Company in 1926 and started producing Grandfather Clocks exclusively in 1960. This makes Ridgeway the oldest continuously produced grandfather clock brand in the United States . Tens of thousands of Ridgeway Clocks since 1960 are part of American families' legacies to be handed down through generations. Shouldn't your family start its History and your Legacy with a Ridgeway Grandfather Clock? Ridgeway mechanical grandfather clocks are still crafted by American clockmakers. This insures that each clock is built correctly. With care your Ridgeway will become the heirloom passed through generations of your family. Ridgeway is an innovator in the grandfather clock category. We not only offer traditional 8-day mechanical chiming movements and dual chime quartz movements but these exclusive industry first: Never-Wind: The industry's only synchronous grandfather clock - all the beauty of a traditional weight-driven clock without the need to wind it every seven days. Ridgeway Clocks - not only America 's oldest Grandfather Clock brand but America 's most innovative. Proudly still made by Americans for the World. 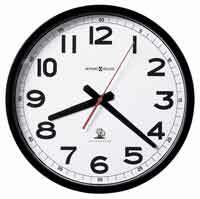 We are a factory Authorized Ridgeway Clock Distributor with free delivery available and the cont. 48 States. Please call us at 1-866-402-8714 toll free for any product information or pricing. The Ridgeway 2564 Archdale Grandfather clock offers a Cherry Bellaire finish on select hardwoods and veneers. An elegant stepped, swan neck pediment features book-matched Olive Ash Burl Overlays with a turned urn finial with decorative carved finial support. Moon arch with an astrological blue moon phase with a pierced star pattern, and a silver chapter ring with applied brass Arabic numerals. Polished brass-finished pendulum with ornamental center disk and polished brass-finished weight shells. Cable-driven, Westminster chime German Kieninger movement with automatic nighttime chime shut-off option. Two Year warranty and Free In-Home delivery. Size: Height, 85-1/2" Width, 22" Depth 13". Glen Arbor cherry finish on select hardwoods and crotch veneers, rubbed crotch veneers and accent bands are displayed on the multi-stepped arched bonnet. Full side crown returns. The large oversize dial is framed in 1/2” solid wood has acid etched corner spandrels and center design with raised black Arabic numerals on the chapter ring and functioning lunar arch. Oversized, large lyre pendulum. One inch beveled glass locking door. The mechanical Triple chime cable movement plays a choice of Westminster, St. Michael and Whittington chimes. An automatic night silence option comes with this movement. Two year warranty and Free in-home Delivery. The Ridgeway Broman 2567 Grandfather Clock is a Swedish style grandfather clock finished in Marquis Cherry. The unique styling of the door with convex glass offers a full view of the weights and the pendulum. Decorative carved accents and a turned urn finial. The dial is an aged, antique print with a minute track surrounding the dial. Weight shells are finished in brushed, antique brass. Cable-driven, Westminster chime German made Kieninger movement plays 1/4, 1/2, and 3/4 chimes accordingly with full chime and strike on the hour. Cable-driven, Westminster chime German built Kieninger Westminster chime movement with automatic nighttime chime lever. Two Year warranty and Free In-Home delivery. Size: H. 89.5"W. 25" D. 13.75"
The Ridgeway 2569 Dover Grandfather Clock has a simple yet elegant design that has a Bellair Cherry finish on select hardwoods and veneers. The Dover has beveled glass on the front and sides and a glass mirrored back. The multi-tiered base featured a bookmatched Olive Ash Burl overlay and bun feet. The cable-driven Kieninger movement is Westminster only with a automatic nightime shut off option. Size: H: 79", W: 23 3/4", D: 14"
This traditional design with an elegant swan’s neck pediment and fully turned finial comes in a Glen Arbor finish and is made of select hardwoods and veneers. Reeded columns with upper and lower turned caps frame the door. The functioning moon dial with pierced stars, raised Arabic numerals and embossed corner and center spandrels glimmer in the night with an interior light. Brass finished weights shells and a lyre pendulum with a matching decorative disk. The front locking door features beveled glass, A high-precision, German-made, Kieninger® cable-driven, Westminster chime movement plays 1/4, 1/2, and 3/4 chimes accordingly with full chime and strike on the hour. Chime silence option. 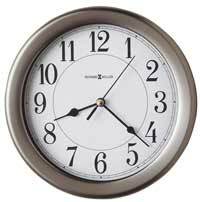 Size: Height 85.25" Width 22.25" Depth 12.75"
This Quartz, battery operated clock will certainly be a welcome addition to your household. Crafted from select American hardwoods and finished in Bellaire Cherry. The Harper grandfather clock represents a smart combination of value, features, and beauty. A mirrored back panel, polished brass finished faux weights, and a large 6-1/2" (165 mm) lyre pendulum bob complete the features of the lower cabinet with fixed front glass. A quartz Westminster electronic melody movement offers a separate strike to count the hours. . A one-year warranty is included with this clock. Requires (3)"AA" and (2) "D" batteries (not included). One year warranty and Free Shipping. Size: Height 78.5" Width 18.75" Depth 11"
Size: Height 84" Width 22" Depth 13"
The Ridgeway 2565 Mildenhall is finished in cherry with a Bellaire finish. The dial features a polished brass finished bezel and includes a silver chapter ring with applied brass Roman numerals and black serpentine hands. Polished brass pendulum and weights with ornamental decorative center disk and weight shell bands. The front door features book-matched olive ash burl overlays with fluted columns. A book-matched olive ash burl overlay continues on the multi-tiered base with two carved ornaments. Beveled glass on the front door. illuminated case with a mirrored back. Cable-driven, "Kieninger" movement features available Automatic night shut-off with a Westminster chime. Two year warranty and Free In Home delivery. Size: H 81-1/4" W. 24-1/2" D. 14-1/2"
This cherry grandfather clock offers a softly curved swan’s neck pediment, turned finial and a full cherry veneer crown return, adds elegance to this clock finished in Glen Arbor Cherry. At the base of the front locking door is an embossed molding. Reeded columns with decorative top caps. The dial features raised Arabic numerals and corner spandrels as well as a functioning lunar moondial. Banded, decorative weight shells and an 8 5/8” lyre pendulum decorated disk. A free engraved brass plate. German chain driven movement plays the Westminster chime and has a chime silence lever on the dial. All three chains need to pulled down once a week. Two year warranty and Free in home delivery. Smaller profile curio clock with swan neck pediment features glass access panels. The lighted top section has two glass shelves as well as two adjustable shelves in the pendulum area. Antique Cherry finish on select hardwoods and cherry veneers compliment a polished brass finished dial with black Roman numerals and stationary astrological moon dial. A free engraved brass plate is available with this clock. Chain driven movement is wound once a week. Two year warranty and Free In Home Delivery. The Ridgeway Rochdale is finished in a Bellaire finish in a traditional style with a mirrored back. Swan neck pediment features book-matched Olive Ash Burl Overlays with a turned urn finial, carved rosettes, and a decorative carved final support. Astrologically correct moon dial. Cable-driven, "Kieninger" movement features available Automatic night shut-off with a triple chime movement offering a choice of Westminster, Whittington or St. Michael chimes. Two year warranty and Free Shipping. Size: H 89" W. 25-1/2" D. 15-1/4"
The Ridgeway 2570 Rutland Grandfather Clock has a contemporary flat top design with a Manhattan finish on cherry hardwoods and veneers. The dial is framed with a polished chrome bezel and the chrome grid pendulum adds to the linear feel of the clock. The Rutland is illuminated by an LED lamp which is dimmable to 3 settings. The Westminster only chiming movement has a nigh-time shut-off option. Size: Height: 80", Width: 17 1/4", Depth: 11 3/4"
This traditional clock is finished in Royale Cherry and features an arched bonnet pediment with a three-part bookmatched olive ash burl overlay. An interior lamp with three-position "Touch Lighting" illuminates the pierced stars in the functioning moon phase dial. Locking front and adjustable levelers. The German built mechanical cable movement plays a choice of three (triple chime) chimes, the Westminster, St. Michael and Whittington. An automatic night silence lever comes with this movement. Two year warranty and Free Shipping. The Ridgeway Wagner 2572 Grandfather Clock has a beautiful painted bisque finish on select hardwoods and veneers. The case features a bonnet top and reeded columns that include turned top and bottom caps. The Cable-driven, Westminster chime Kieninger movement plays 1/4, 1/2, and 3/4 chimes accordingly with full chime and strike on the hour. It also has a Automatic nighttime chime shut-off option. Two Year Warranty and Free In Home Delivery. Size: Height 83", Width 22.25", Depth 12.75"
A solid arched bonnet on the crown and reeded pilasters with top and bottom turned capitals is shown on this clock finished in Country Maple on select hardwoods and veneers. An interior light reflects off of the three adjustable glass shelves and is a perfect display for collectibles. Access to these shelves is made easy with two full length side glass doors. A time only, non chiming quartz movement uses one AA battery (not included). Size: H 79", W 22", D 11"
An elegant swan’s neck pediment with reeded side columns. Upper and lower turned capitols in a Glen Arbor finish on select hardwoods and veneers. An elegant burl back panel is seen behind the cables. This battery operated movement offers a choice of the Westminster or Ave Maria chime and features volume control and a night silence option. Two year warranty and Free In-Home Delivery. Size: H 78", W 20", D 11"